Needless to say, thermostats play a key role in minimizing your electric bills considerably. However, buying an efficient thermostat within your budget is important. 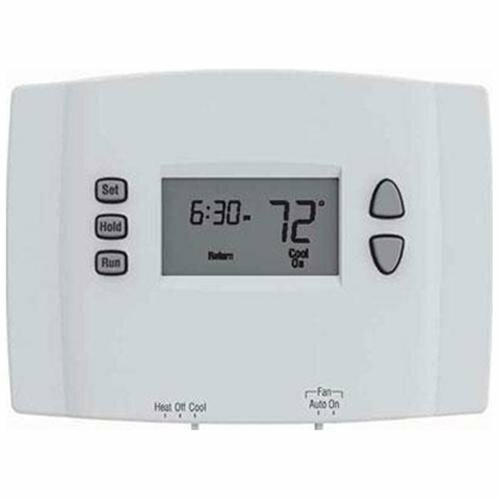 There are some great thermostats available at reasonable prices in the industry. It’s up to you to find those and buy one for your home. In this article, we review 5 cheap and low cost programmable thermostat that are affordable in your budget. Read detailed review of the affordable thermostats that don’t compromise on the quality of performance. This is a simple and easy to use 5-2 day programmable thermostat that saves you up to 33% off your energy bills. It allows you to program weekends separately from week days, each with four program periods in a day. The simple programming logic used with a large viewing screen and control buttons makes it easy to use. The thermostat features accurate ±1 degree Fahrenheit temperature control for consistent comfort. The large backlit display can be easily viewed even in dimly lit rooms; it shows room temperature, set temperature and current temperature. These thermostats are pretty easy to install and the best part is that they are pre-programmed for your convenience. Besides, these devices are compatible with all single-state heating and cooling systems. You get one year limited warranty period. The cost of the device is $23.99 – proof that it is a very handy option for everyone. Con: This Honeywell thermostat cannot be used on multistage systems or heat pumps with auxiliary/backup heat. This thermostat is exclusively designed for use with electric space heaters and window air conditioners. It can be plugged into a regular household receptacle outlet! It sports a positive on/off switch as well as a heat/cool switch that enables you to use this product for the two main seasons: summer and winter. This thermostat model provides you with the convenience of 5-2 day programming helping you to create different set of programs for weekdays and weekends. There is a patented Lux Speed Dial for easy programming along with a battery-free memory storage feature. Similar to all programmable thermostats, this model helps largely on reducing energy consumption; however, it doesn’t stop there. This Lux model is preprogrammed with default heating and cooling schedules designed to save up to 33% on energy bills annually and it also helps minimize your carbon footprint, ultimately maximizing your home’s energy efficiency. Being 100% mercury free, you can be rest assured that it is a safe and an eco-conscious choice for your family. The cost of this gadget is about $38, much lesser compared to a lot of other programmable thermostats. This model from Honeywell is designed to maximize comfort as well as minimize household energy use, eventually saving your money without compromising on comfort. It features a large backlit display provided with the conventional soft-touch button interface. The thermostat has accurate temperature control of ±1 degree Fahrenheit with auto change from heat to cool. 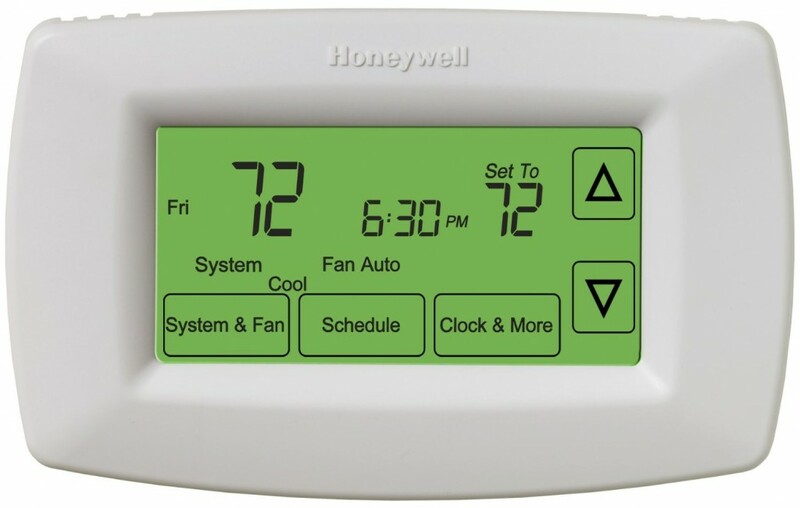 Unique features of the Honeywell thermostats, that is, the Smart Response Technology and Filter Change Reminder are some exclusive options made available at a nominal price. The device is compatible with a range of systems including any heating and cooling system as well as single-sage heat pump systems. The design is user-friendly enabling you to program on weekdays, Sunday and Saturdays separately. Good news is that the gadget is Energy Star rated so you need not worry about its efficiency. The price of the Honeywell 5-1-1-Day Programmable Thermostat is about $48. Con: This model cannot accept a power feed from the system, and so NEEDS batteries to function. The device is of course irrelevant if your home doesn’t have a system power feed. Well, there are a number of reasons why you would love this Lux 7-day programmable thermostat. It is a clever device that offers you with precise and complete temperature control at the touch of your finger – easy to use touch screen interface. This Lux model sports a variety of user-friendly features such as a responsive touch screen, do-it-yourself installation and a large lighted display that facilitates straightforward programming and operation. The large blue electroluminescent display is convenient to read, even in dimly lit rooms and it shows the current day, time, temperature as well as the filter status. In addition, there is an audible touch confirmation which indicates that your options are being registered in the device; the flame and snowflake icons indicate cooling or heating mode. The device is compatible with a number of heating and cooling operational systems. The thermostat lets you to program maximum four different time and temperature settings in one day – morning, afternoon, evening and night. Besides, there is also an option to set a different program for every week day. As far as budget-friendly thermostats are considered, this model is the best energy-efficient choice that saves your family about 33% on your home’s energy bills. Thanks to the keyboard lockout feature; the thermostat is ideal for houses that have small children or other similar unauthorized users. In general, this unique device is very much user-friendly, easy to install, menus and settings are intuitive and easy to comprehend. On the whole, this Lux model is an excellent product available at a very reasonable price! It costs about $65. 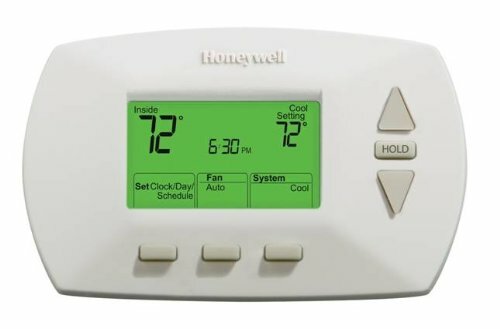 Honeywell has designed this thermostat for easy use and quicker installation; besides, it is loaded with a number of convenient features and offers programmable and customizable control over your home’s temperature without making too much of constant manual adjustments. The thermostat enables you to program each day in a different way and customize temperatures four times per day making it easy to heat or cool your home based on your comfort. The signature feature of Honeywell thermostats, Smart Response Technology, is present in this model as well. The easy-to-use touch screen keeps all operations and programming simple. The thermostat helps you save up to 33% on annual energy costs. A unique feature of this thermostat unit is that it can be run using power from your heating or cooling system as well as battery power; this gives you an option of permanently getting rid of battery changes. The thermostat is capable of delivering permanent day and time settings; these are maintained even during power outrages. There is an option of automatically adjusting the Filter Change Reminder function as well as Daylight Savings Time. Moreover, this thermostat is compatible with a wide range of heating and cooling systems; however, it is not compatible with electric baseboard heat. This thermostat comes to you with a one-year limited warranty. 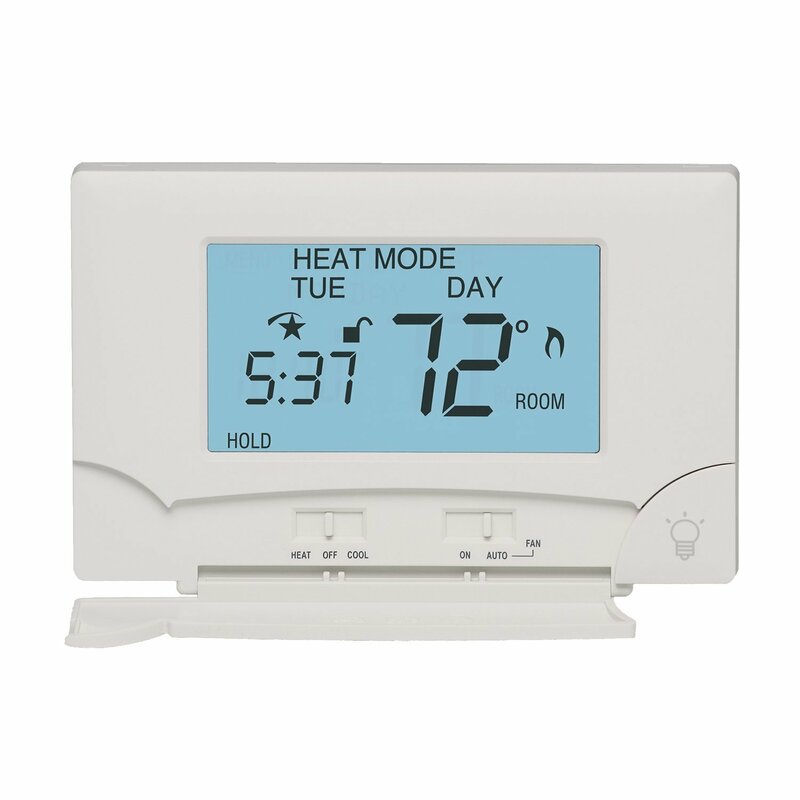 The price of this Honeywell 7-day programmable touch screen thermostat is about $87.50. Con – There is no back light button. For the back light to turn on, you have to touch one of the buttons on the screen which leads to a bunch of button presses. Therefore, to check the temperature in the dark is not that easy. Well, if you consider the features of the above-mentioned models, you can easily decide on which one may best suit your requirements and budget. In fact, instead of buying higher end models like Nest that cost more than $200, you have cheaper options that still serve the purpose of saving your energy bills. The Honeywell 5/2-Day Programmable Thermostat costs just around $24 which is really a very cheap option. And again, nowhere you are compromising with the efficiency of the device. Thus, there are a number of efficient thermostats available at incredibly affordable prices. Get the best deal to cut down on your energy bills!